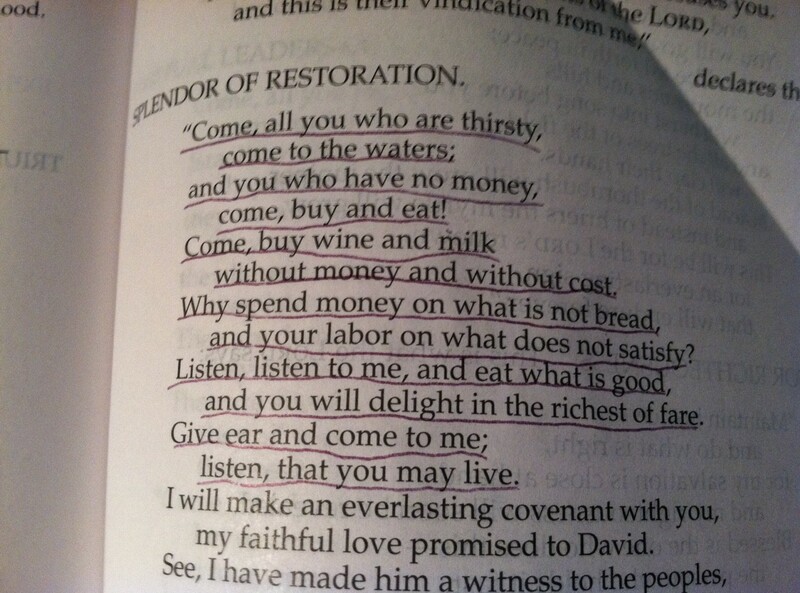 We come to you, dear God, for we are thirsty…. thirsty for the water that only comes from you. We have no money, nothing of value except what you have given us. We can come to you through your gift of grace and you take care of all of our needs. Everyday. But sometimes we still get tempted by the distractions of this world. And we spend our time and our passions and the resources you give us on things that don’t satisfy us. They never will. Only you, dear Father, can satisfy the desires of our soul. We want to listen….and then listen some more. We want to eat what is good – all of the good things that come from you. When we focus on you, we are delighted by the richness of what you provide. More than we ever dreamed. We give you more than just an ear, dear God. We lift up all of our heart, mind and soul to you today. We desire to live in your will. Please quench our thirst, Holy Father.